Health insurance offers more than just medical care; it offers peace of mind and reassurance. The harsh reality of the matter, however, is that even the best medical insurance plans can still leave you with expensive deductibles and co-pays, not to mention the unforeseen out-of-pocket expenses that can come with an extended hospital stay. That’s where hospital indemnity insurance plans come into play. Created to aid with gaps in traditional medical insurance coverage, these supplemental insurance plans provide daily benefit amounts for each day you or a covered family member spend in the hospital. More than 16 million emergency room visits a year result in hospital admission, with the average duration of a stay nearing five days. For a patient who has a hospital indemnity plan with a daily benefit of, say, $250, those five nights would result in $1,250 directly in his pocket, which is a welcome change to the usual shelling out you’d be doing after spending that much time in a hospital. When considering a hospital indemnity insurance plan, you should choose one that will provide you with expense coverage when you need it, how you need it. Purchasers may select their preferred daily benefit amounts (e.g. $100 per day), and different plans provide different payment methods. Typically, plan holders are free to use their benefit any way they choose. That’s because many hospital indemnity plans offer predetermined payouts tied to the occurrence of a hospital stay, as opposed to a la carte payouts tied to specific services. You can use payouts for living expenses, rent, car payments or even for your medical insurance co-pays and deductibles. Tip One: When selecting your chosen daily benefit amount, make sure to take into account your current financial situation. Select the amount that will best fit your needs in a state of emergency. Think about the expenses you would incur during a hospitalization (travel, child care, housing for relatives) and how you might put your payout to its best use. Daily benefit amounts with TMA Insurance Trust Supplemental Hospital Indemnity plans start at $100/day. Tip Two: For instance, with over five million patients admitted into intensive care units each year, many hospital indemnity insurance plans are offering special benefits. Find out if your hospital indemnity insurance plan has any specific benefits regarding intensive care units. With TMA Insurance Trust, benefits double for patients in intensive care, as well as for those receiving inpatient cancer treatment. Tip Three: It’s essential to find out what, if any, coverage limitations your plan has. How long will you be eligible to receive your daily benefit payout? Don’t sign up for a hospital indemnity insurance plan only to find out you’re only eligible for five days of benefits. This will do you no good in the unfortunate case of an extended hospital stay. TMA Insurance Trust offers 365 days of coverage, consecutively. As you begin to research different hospital indemnity insurance plans, you’ll quickly find that some plans have a lot of fine print to go through. Don’t get stuck in a bunch of red tape when it comes time to cash out your daily benefit payout. Take your questions to a trusted advisor and ask for help. Contact an insurance advisor today to get started on selecting the hospital indemnity plan that is best suited for you. They’ll be able to answer all your questions, shop the open market on your behalf, and help you pick the best plan to make you feel happy and safe. Let them do all the work – that’s what they’re there for. Hospital indemnity insurance isn’t tied to annual health insurance Open Enrollment, so the best time to enroll is now. 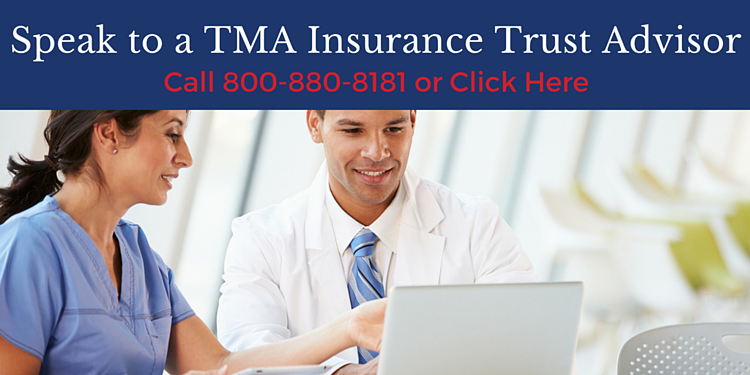 TMA Insurance Trust offers Texas physicians comprehensive plans that provide an extra safety net and allow plan holders to feel taken care of, no matter what may come.